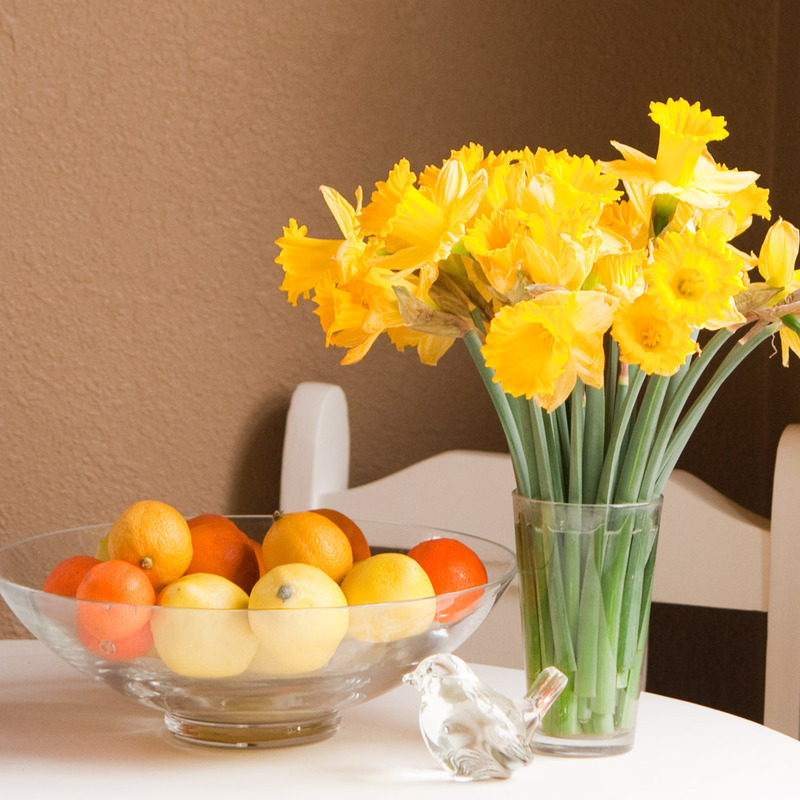 fill your house with flowers! i love flowers. fresh ones, preferably: they smell good, they look good, they bring a little bit of nature inside. it’s a little splurge that brings a smile to my face every time i walk by. all of these flowers are in my house right now: i was feeling extra splurgy last week and spent $20 on fresh flowers. some of my friends recently told me that they “don’t know how to arrange flowers”. i say “pfffft” (or something like that): you don’t have to be a florist or have a green thumb to surround yourself with simple beauty on a daily basis. most of my flowers come from the grocery store. i don’t pay much for them, and i often find myself taking apart existing bunches of flowers and tucking a sprig here and there around the house. i especially love flowers in unexpected places; i even keep a little arrangement on the back of the toilet, like this one (below), which has ranunculus, waxflower, and delphinium that all came out of a big multi-colored bunch that included the yellow mums shown above. but when i say arrangement, i don’t mean fussy. 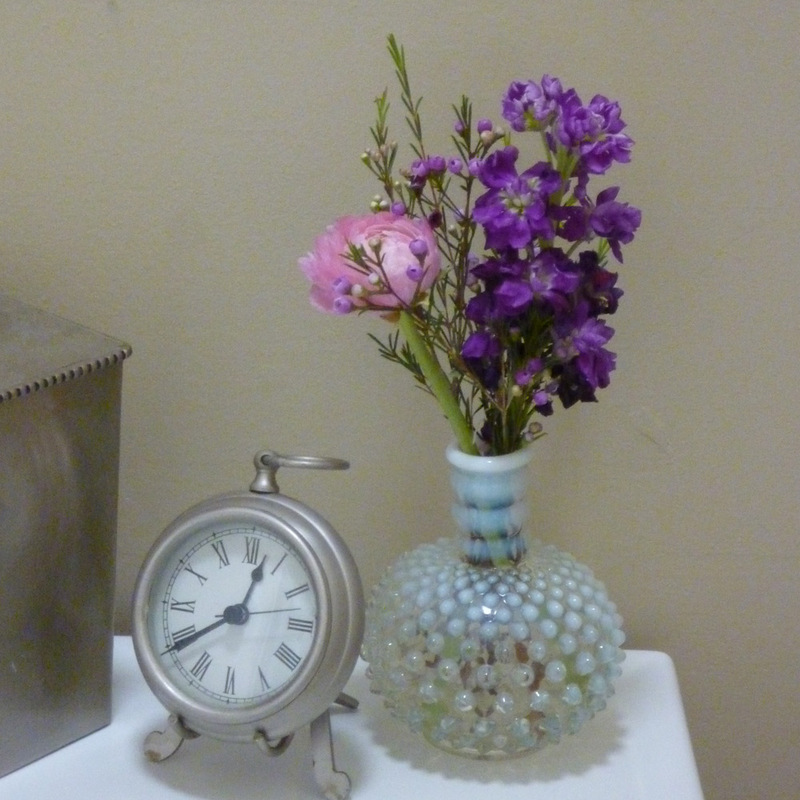 i mean pick a pretty container (even a juice glass will work) and plop in some flowers. i generally put similar colors together at a similar height and group the same flowers together at an unexpected height, which usually means cutting the flowers pretty short. buy flowers that you think are pretty, but don’t spend too much unless you just have to have that one particular kind of flower. 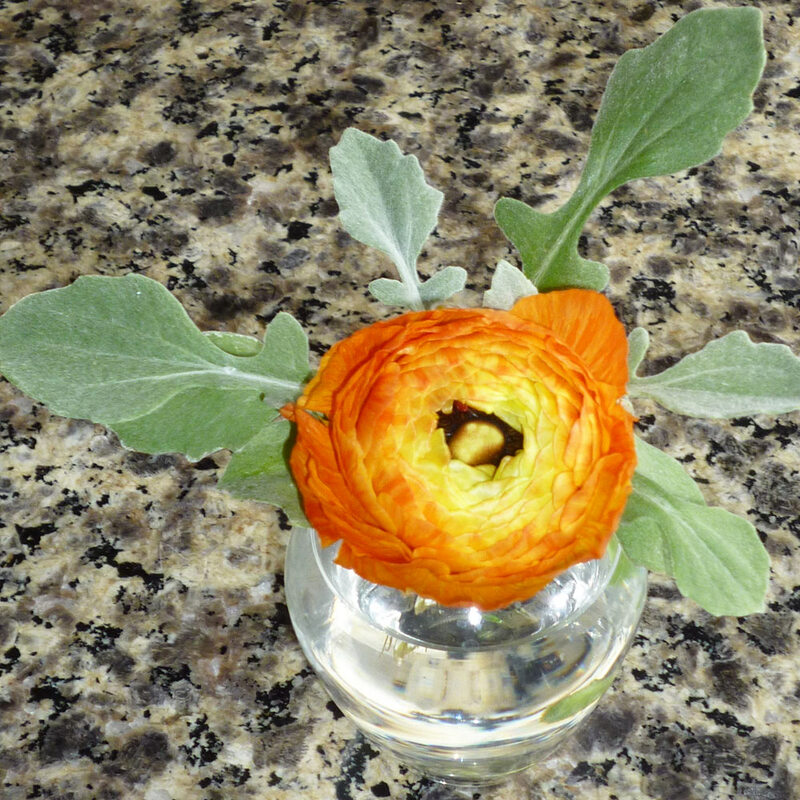 it’s okay if you need that flower; i feel the same way about ranunculus. but in general, get what’s in season and on sale. carnations and mums are two regular cheapies; make them look fresh and modern by cutting them really short. if you’re lucky enough to have a garden, you have a supply of beautiful flowers and/or greens. break up the existing bouquets. don’t for a minute think that the person behind the counter knows any more about flowers than you do. put flowers of similar colors together. put all the same kind of flower together. 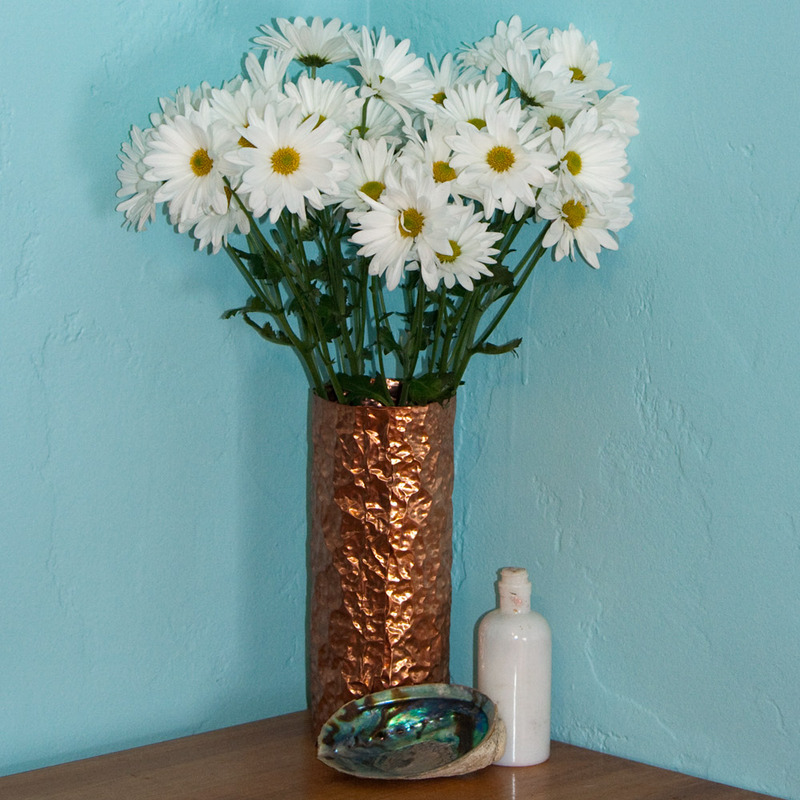 put a single bud in a bud vase. then group those individual containers together; think in groups of odd numbers, or add a candle to an arrangement of two containers to get to that magical odd number. cut those flowers down to size. ever notice that the arrangements you buy tend to be all the same height? ugh. no wonder they never look good plopped in a vase. 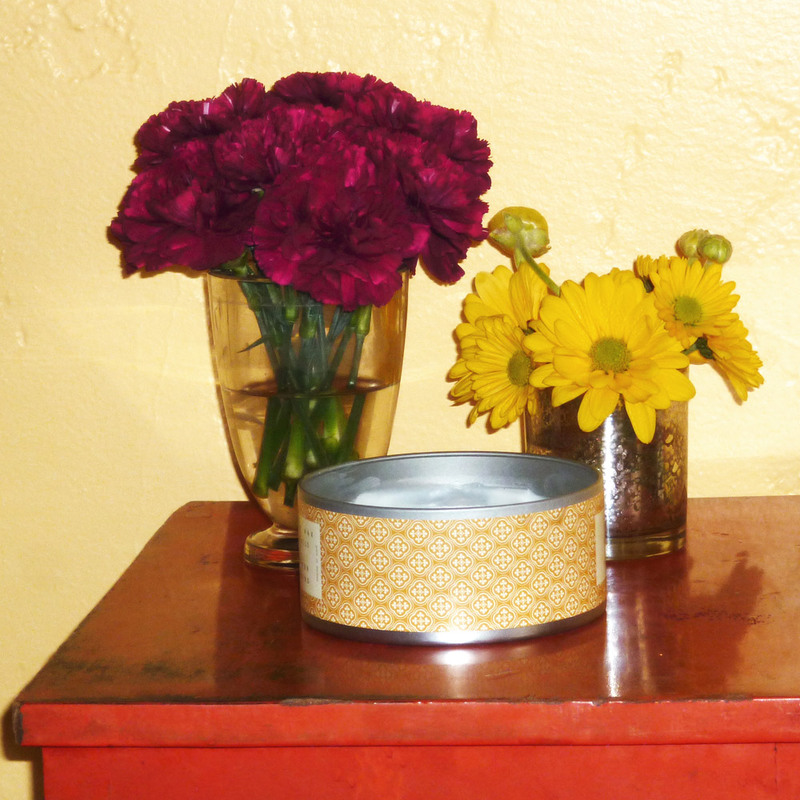 cut the flowers to just a little bit taller than the container you have to put them in. bonus: this has the magical effect of making it seem like there are more flowers. 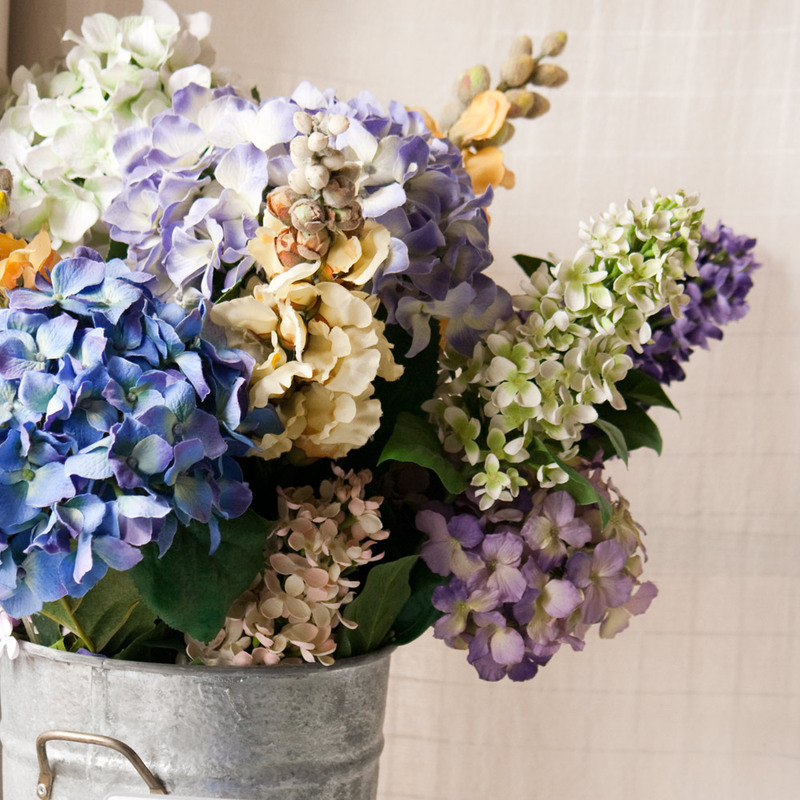 put small amounts of flowers all over your house rather than having just one large bouquet. it’s a casual effect, and feels like you could have picked them from your own garden, even if you don’t have one. 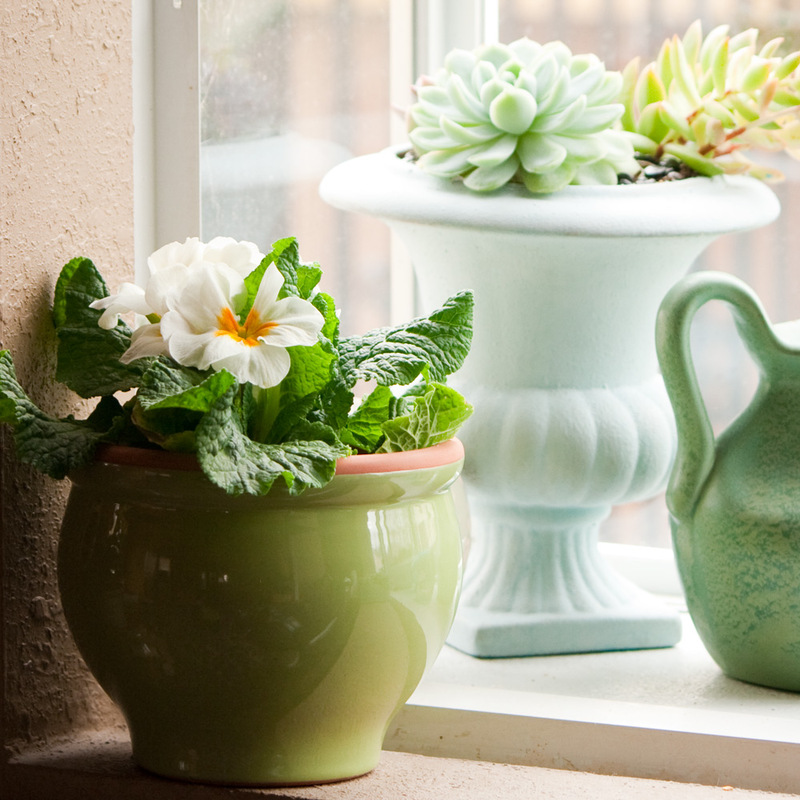 and of course, don’t limit yourself to fresh cut flowers when there are cute potted plants and pretty fake flowers. 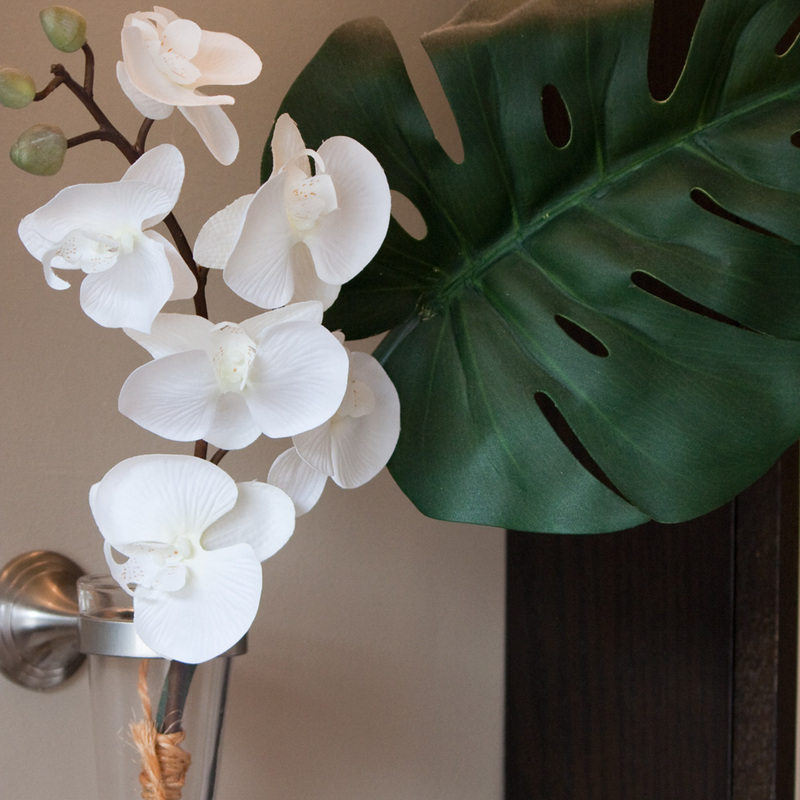 and you can’t beat fake flowers for their easy-going nature. you don’t have to water them, they don’t care about temperature or sunlight, and you just vacuum them off when they get dusty. then when you get bored with them, just move them around your house for instant redecorating! 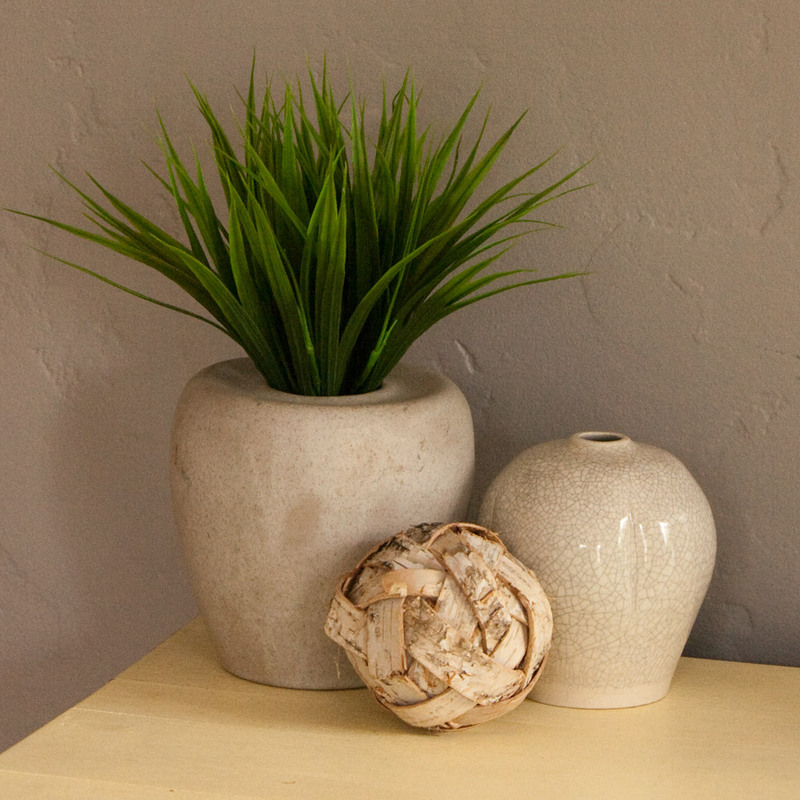 don’t worry, you can find good looking fake flowers–all of mine came from craft stores. if you get them when they’re on sale, or use a coupon, you can get some pretty good looking fake stuff for not too much, with the added advantage that they will last forever. 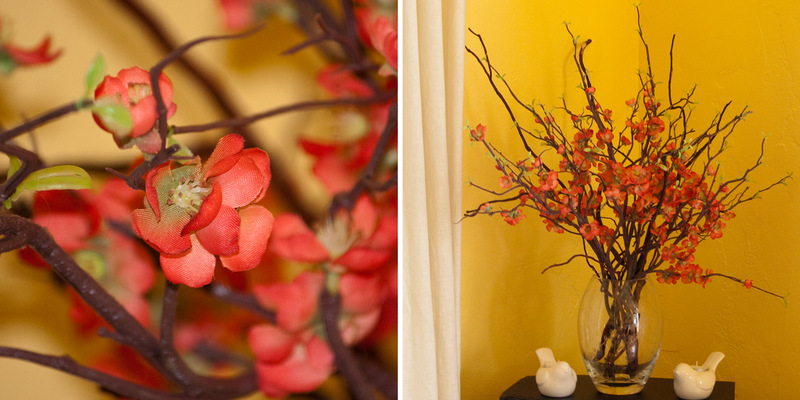 don’t get me wrong, some of the fake flowers out there are crap, but in-between the crap there are some goodies, like the artificial quince (above) and the fake fern (below). the key to making fake flowers look real is to kind of fluff them up, because they’ll be all squished together when you buy them. bend the plastic coated wires in a random, natural looking way and they start to look a lot more realistic. 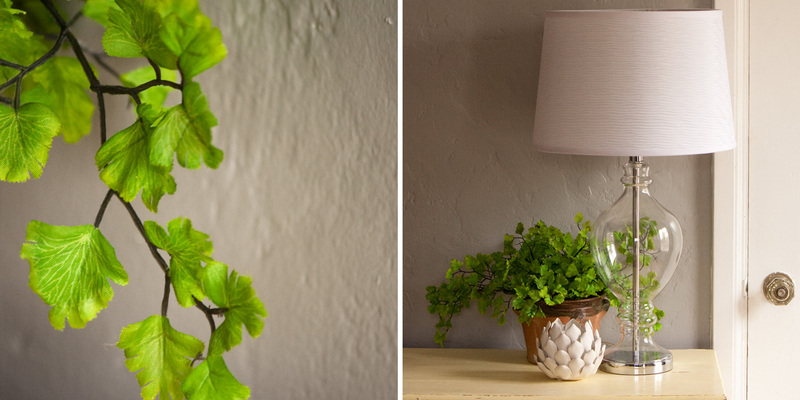 if you don’t know what will “go” with your decor, remember: green goes with everything. i didn’t just make that up, it’s mother nature’s rule. Entry filed under: make your own!. Tags: arrange, arranging, flower, how to, made easy, tutorial. life (without sadie) goes on	gah!